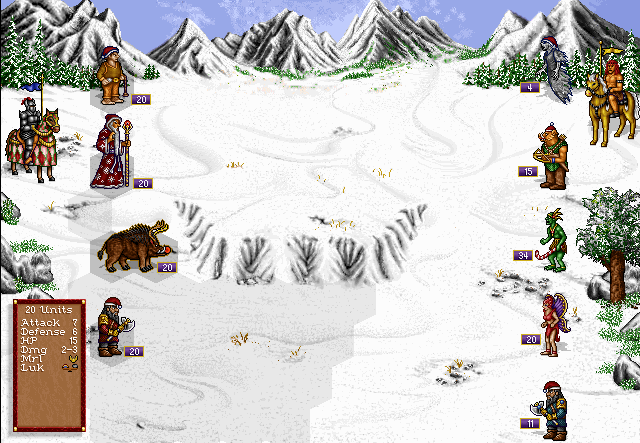 The New Year Mod for Heroes of Might and Magic II is a Christmas-themed graphical conversion of HoMM2 assets intended to keep the original graphic style. The idea of this mod was born suddenly, when a few fellow forum members on Russian HandBookHMM.ru community in December, 2014 thought about a new form of an offline tournament which would be able to revive the HoMM2 gaming community to some degree. Now the mod is released as a standalone development, usable both with The Succession Wars and The Price of Loyalty. The v0.1 release of the mod dated as 1st of January, 2015 includes full graphic conversion of 9 creatures and 1 adventure map object. The next New Year may also be the date for the new mod release, with new creatures, objects, and more. The reinboar's horns are animated! The first version of the mod released in 1st Jan, 2015. To install, run setup.bat. To uninstall, run uninst.bat. Usable with BOTH SW and PoL. Well, this is a different idea! If I may offer a suggestion, I think that the Halflings would look better dressed as Christmas elves. It would offer some diversity to the designs. But we have Sorceress' Elves who deserve this much more Yet, making Halflings as a small variation of elves sounds like a cute idea. Hmm... the only thing that I think wouldn't work with making the elves look like the Christmas kind is the size difference. Maybe.... give the Sorceress archers a Christmas tree camoflague? Or, maybe a nutcracker outfit? This just my opinion, however. Do what you think is best! Frankly, this modification is not a high priority in my enormously big to-do list since I've got lotta graphics to do for H3SW and Project Ironfist, aside from other work. So that I would prefer to make it humble, yet I still dream to find time for converting the whole Wizard townscreen to a snowy one. I already had some drafts thanks to Kivo. Still, working on this mod was definitely fun and a lot of new experience since modding H2 is 10 times harder than it is for Heroes 3. I learnt many useful palette tricks later used in H3SW as well. Of course I don't I can provide any creature graphics resources you need for it. Pretty sure you will benefit from a wider variety of frames. How Heroes of Might and Magic II: New Year Mod can be installed ? See the description of the download. To install, run setup.bat. To uninstall, run uninst.bat. Both setup.bat and uninst.bat must be placed in your HoMM2 directory. Do you now have the capability to move posts from one thread to another? Sort of. Kinda inconvenient mechanism to be honest. Thank you. But what if i want to use it for the dos version. Because i wanted to choose the files. Ahem, it doesn't matter which version you use. This mod simply replaces 9 creatures and 1 map object in HEROES2.AGG.